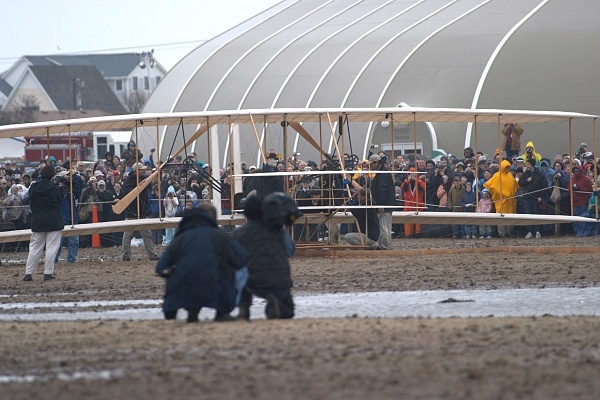 These photos were taken by me, Fred Bruenjes, at the 2003 First Flight Centennial, a reenactment of the Wright Brothers first flight at Kitty Hawk, North Carolina. 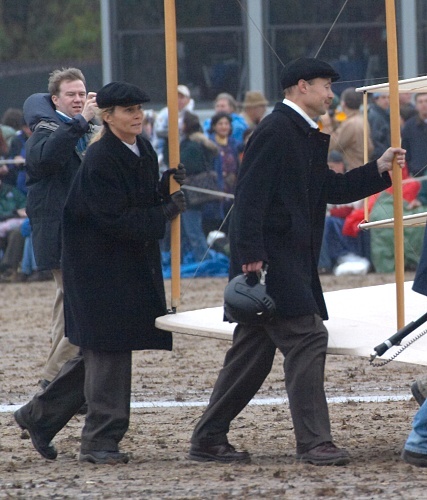 This unique celebration was planned to feature a reenactment of the Wright Brother's first flight, at exactly 100 years to the second after their first flight in 1903. The show also would feature flyovers of historic aircraft and speeches by dignitaries. As an aviation buff I HAD to go. I got up at 3:30am EST and drove from Norfolk, Virginia down to Kitty Hawk. Upon arrival (at 5:50am) security was understandably tight. 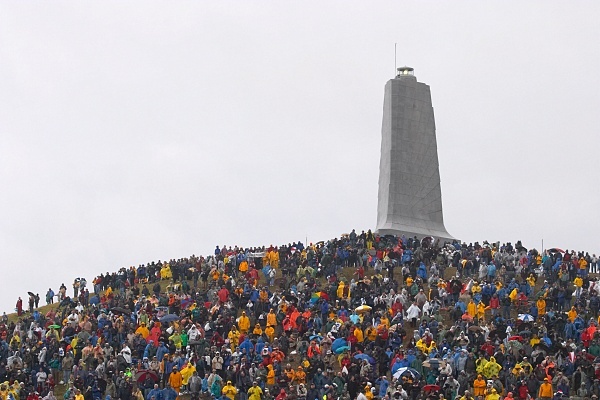 The Wright Brothers Monument is visible on the hill at right. 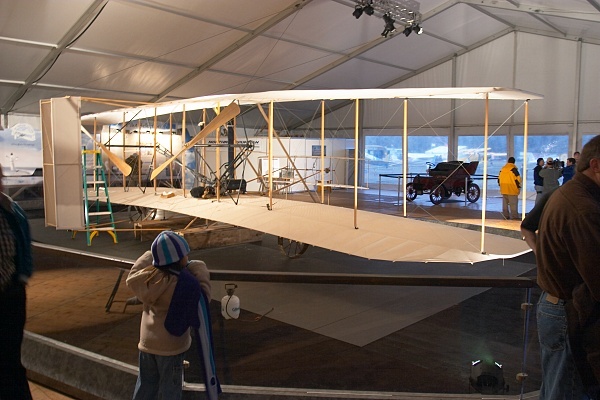 The lit tent at left housed the Wright Flyer replica. Climbing to the monument hill provided a great view of the area. 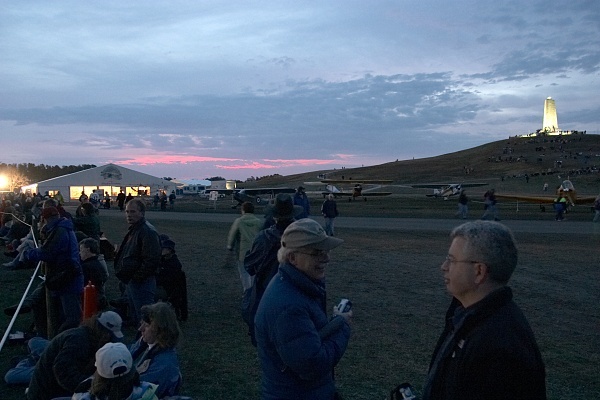 We got front-row seats at the field near the yellow airplane at left. By 6:30am all of the front-row spaces were taken. Inside the tent the Flyer was on display, still undergoing last minute preparations. 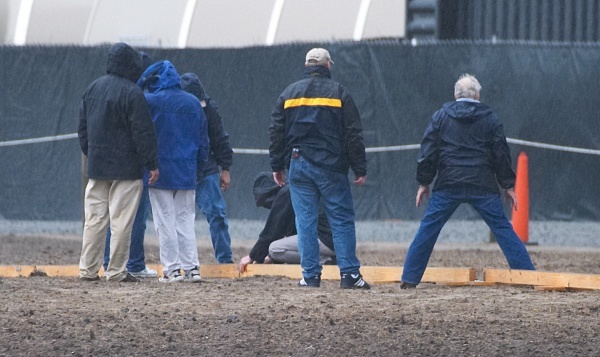 As we shivered in the cold, the rain, and the wind, they set up the launching track. The media was all lined up to report on the event. 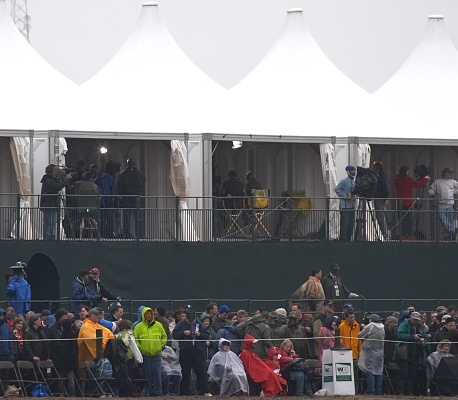 I counted 18 satellite trucks and 13 media tents, with more cameras and big lenses than I could possibly count. 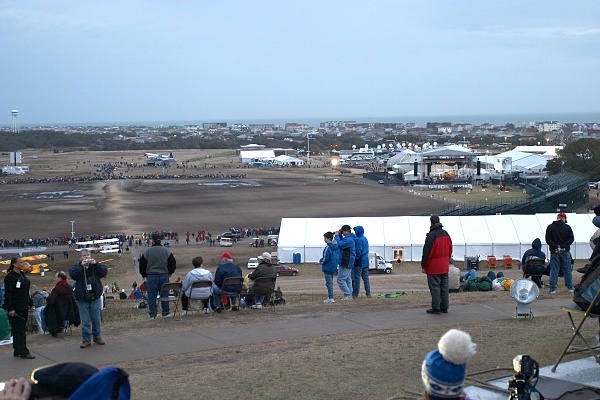 As President Bush arrived the crowd cheered. He was in the helicopter at right, in the distance. Actor John Travolta gave some introductory remarks. 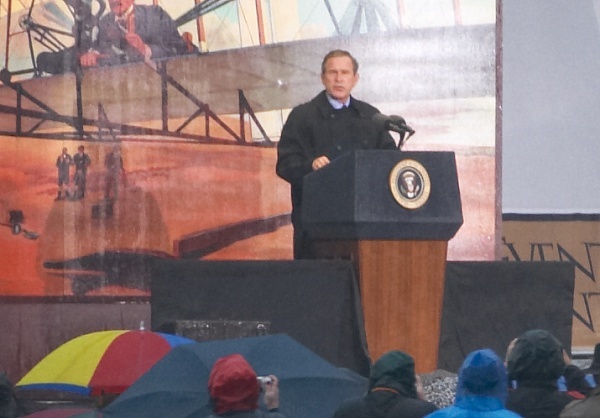 President Bush then delivered a speech in the pouring rain. 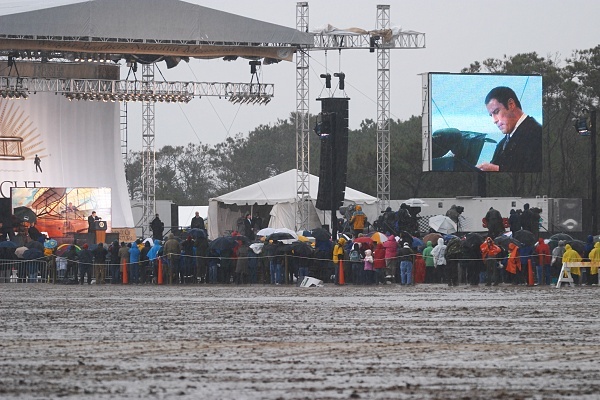 By now the area was packed, no one wanted to miss the President's speech. There were rumors that he might lay out a new program of manned space exploration to the Moon and Mars, but that did not happen. 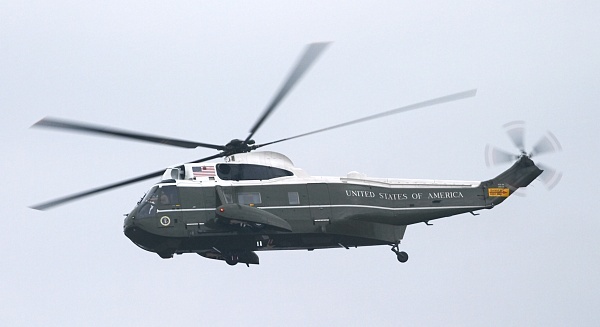 After delivering the speech he reboarded Marine One and flew away. 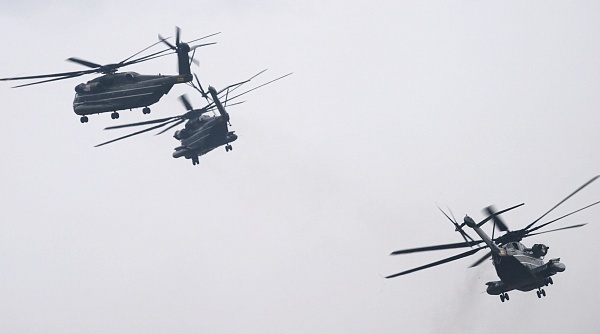 Four other large helicopters accompanied him. 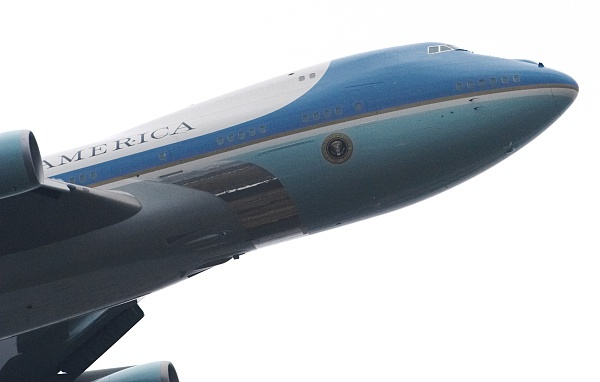 The President transferred into Air Force One at a nearby air base and gave us a surprise, low alititude, slow speed flyover. 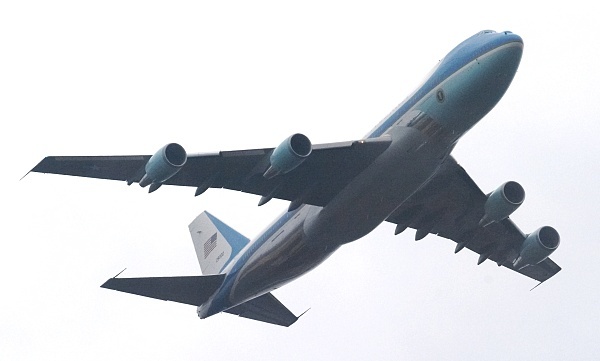 This was a REAL treat, normally the Secret Service would not allow this type of flyover, especially with the President on board. 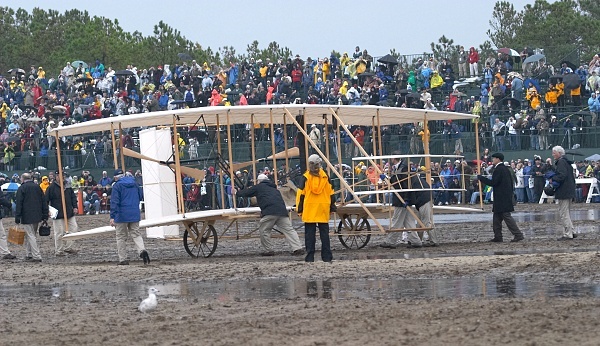 The weather didn't cooperate, at 10:35am (the time of the Wright Brother's flight) the winds weren't quite right, so the reenactment was postponed. At 10:35 twelve seconds of silence were observed, along with a flyover of the "Spirit of Kitty Hawk" B-2 Stealth Bomber. Finally, close to noon they rolled out the Flyer. The engine had to be started by hand cranking the propellers. It took many tries, it must have been hard work! 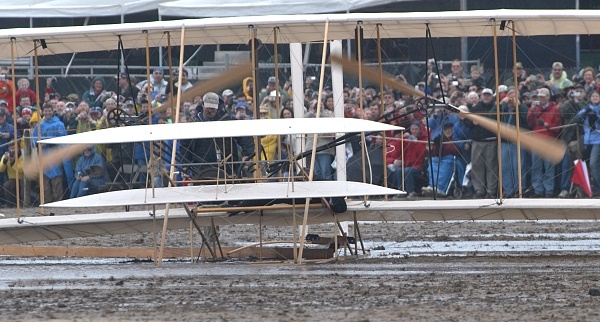 But to no avail, the winds weren't strong enough and the plane plopped into the mud puddles. 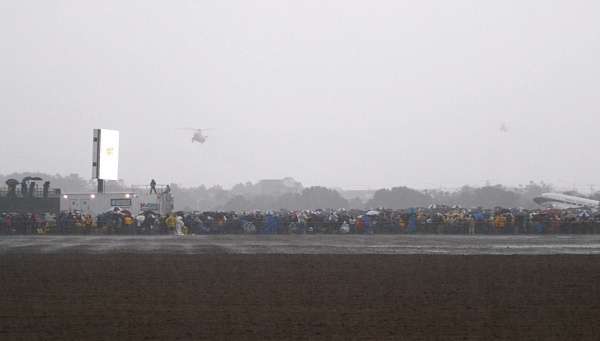 Unfortunately they had to roll the plane back to the tent for inspections. 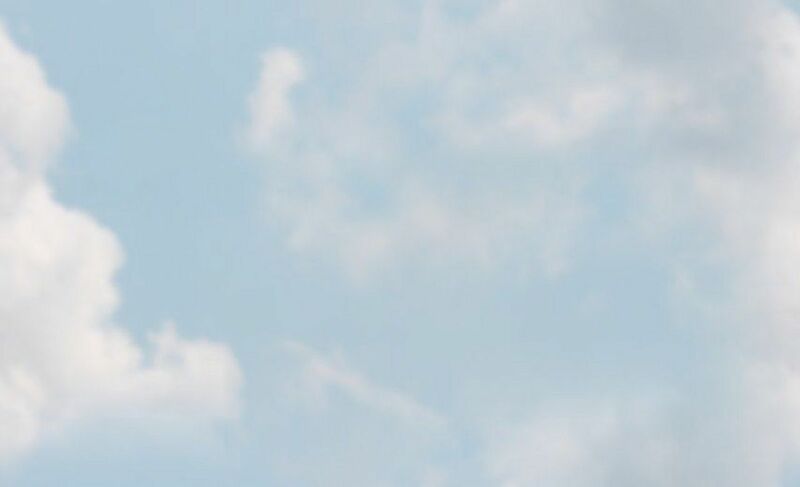 The Flyer pilots are clearly disappointed. 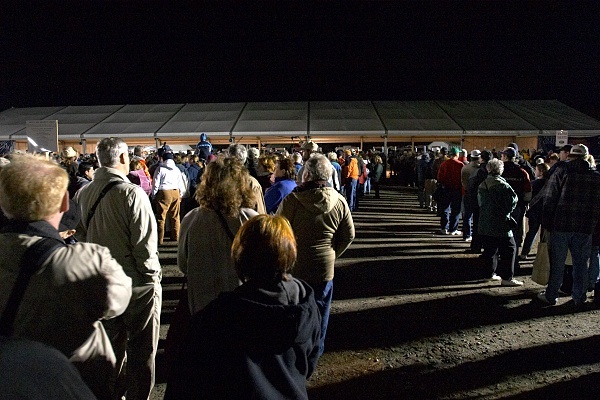 I waited around to see if they would try again, but at 2:30pm I had to give in, I had been standing in the cold and rain for eight hours and could stand no more. I saw on the news that they tried again about an hour after I left, but again the winds weren't right. I was very disappointed that the weather didn't cooperate. Among the planned flyovers was a U-2 spyplane and John Travolta's personal 707 jetliner, two aircraft that you rarely see flying. 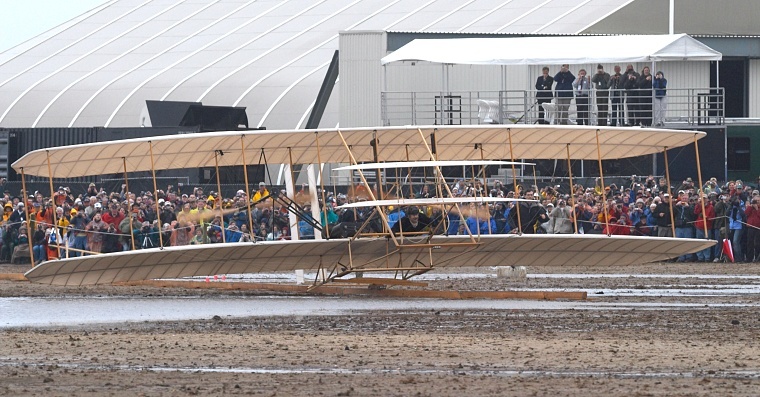 Oh well, it was worth the trip, I got to see the President, Air Force One, Marine One, got to see the Flyer replica attempt to fly, and was in the same field where the first flight took place 100 years ago. Despite all of the weather problems I consider this trip to be a success!